Tent: Northface Stormbreak-1 vs Marmot Tungsten 1P? I've got a couple of good Marmot tents from years ago (Zoom 2-person and Monarch 3-person), but they're a bit big/heavy for carrying while backpacking or bicycle touring. I'm going to be doing a 2-week bike trip soon, and want to get a light 1-person tent to lighten the load, and have broken it down to about 3 of them (based on my desire for a simple tent with only 2 or 3 poles). I basically just need a lightweight 1-person tent; expense isn't important, I like good quality; must be free-standing and pack reasonably small for fitting on a bike rack; I'll be using this at first for bike touring, but in the future for solo backpacking trips of varying lengths. 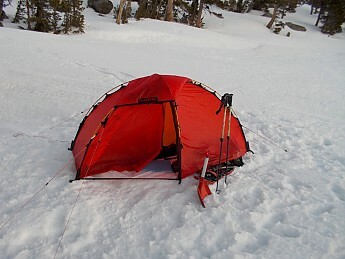 Price is not important (within reason - less than $500); most important to me are easy/clever setup, high quality and durability, good design; I don't like the newer tents with complex pole systems (split poles at the end, poles going over the front/top to add more width or height, etc.). My first tent was a Moss Starlet, just 2 sleeved tent poles, very simple. The first two are reasonably cheap, the third much more expensive. Also, the Stormbreak-1 has less netting in it (which is good for privacy), and the top 3/4 of the Marmot is almost all netting... I'm a bit concerned about privacy and maybe always having to use the fly on the Marmot due to that. So... does anyone have any recommendations for a small solo tent of quality? Any opinions about the above? I have an old TNF Tephra22 that is very similar in design to your Moss so I can totally relate to your appreciation for what you have. That pole pattern really handles wind amazingly well. As for your list of potential new tents I was surprised to see the Hubba NX on there as it has both hubs and a top cross bar which you said you were hoping to avoid. I am using a Hubba (previous version) myself and don't find the gadgety mono-pole to be an issue. It is actually much much easier than the sleeved poles on my Tephra since you can just get the pole into position and clip the tent body to it. Yeah, the Hubba NX is there just because - when researching tents - it got a lot of marks as a really good tent, one of the best of the bunch, despite the extra poles and such, which is why I included it in the list. I'd prefer something not as complex as that, but I also want something of high quality. I get the opportunity to see several tents in action through scouting events. In my experience, I think the MSR is over rated (although I don't have experience with the NX and only the Hubba) and the North Face will build up condensation due to the lack of screen. I can't comment on the Marmot. I would like to throw one other tent in for your consideration. The Big Agnes Fly Creek UL2, which I purchased back in 2011, has been a great second home since. If you are interested you can read my review here but in short, although it is listed as a 2 person tent it is really 1½ which works well with gear. It does have a hub, but I have never found it to be an issue, and it is as light and packable as many of the true one man "coffin" tents. It can be free standing, one of my requirements too, but is more spacious if it can be staked out. As with many of the lightweights, the material is thin and must be maintained. It's not an easy task picking a tent and preferences are as individual as a backpack. It sounds like our criteria were very similar, which is why I made this suggestion. Good luck in your search! I recently went thru a similar evaluation. My selection is the Big Agnes Copper Spur 1. Only 2.5 pounds actual carry weight . It does use a lot of mesh on the top for ventilation and star gazing. Unlike many other 1-person tents, the splash wall comes up quite high on the body periphery which will prevent most wind driven or hard rain from entering the tent itself. It has a cross pole at the top which keeps the side walls from collapsing in when the fly gets wet! The newest (and lightest model) has only one door. Setup is quick and easy with their modular pole assembly which along with the fly is color coded for matching end set up. Carried by REI which is coming out with another 20% off for members this weekend...just in time for your purchase. In my opinion, The Marmot Tungsten 1P is the best. 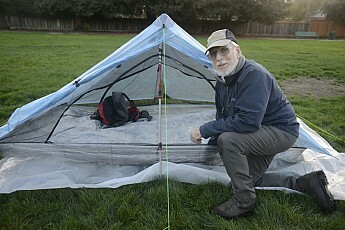 It is a great little tent that is light and packs small. The inside is great, lots of space in the tent and the vestibule. In my mind, this is the best solo tent their is. It is not like you are going to change with the fly off, even if their is hardly any mesh, people might look at you. It is only $179.00! This is the cheapest of the three and in my mind, the most practical, lightweight, roomy, and all round the best. Total weight with stakes is about 5 pounds. There are single and double versions as well that are even lighter. Both of those are somewhat pricey. The Suolo, though will stand up to anything the weather can throw at it (it is expedition level). Thanks for your suggestions, Bill! I was actually looking at those Hilleberg tents - the Suolo and the Unna. They look fantastic and extremely well-built. My only worry with those is venting - they have almost none, seems like you have to depend on opening the door to get air in. Have you used your Suolo in hot/humid climates? How have they performed in those environments? Tim, the thing you can't see in the photo is the way the interior and venting is done. If you click on the photo, then click on "view/download original", you then can look closely at the top of the Suolo. Notice that there is a flap, a sort of "mini fly". The tent body itself is a narrow 1-person width plus enough space to bring some gear inside. There is a full fly covering the inner body, the half-door of which is rolled back in the photo to reveal the spacious vestibule, which is where you would put your pack. If you have a ground sheet, a second person could sleep in that vestibule. But, as a solo, you can unzip the door or both doors of the inner tent, and then have a large open area (2 people's worth). For just 1 person, when you have the outer fly zipped closed you can unzip the upper part which is under the flap, giving lots of ventilation, with heavy rain or snow blocked from entering. There is plenty of ventilation available for hot humid (90/90) climates. Flap detached and folded back so you can see the vent opening for the vestibule outside door, inner tent door unzipped to see interior, flap on the fly opened. Flap laid across the opening. You can see the fly vent hole cover folded down. I know some people who have cooked in the vestibule, venting through that unzipped area under the flap. 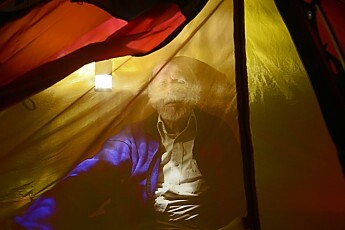 I would strongly discourage that myself, since the tent is, like most tent fabrics, NOT flame resistant. The ultralight ZPacks tents also have plenty of ventilation, since the "bathtub floor" is attached to the "tarp" top by noseeum screening completely around the tents, plus the doors are the same screening. One other question about the Hilleberg tents - one thing I like about the tents I already have is that they vent well (top 1/3 is mesh), but you can get good airflow and still keep insects out due to the mesh. Can the same be said of the Suolo? That is, with the venting technique you mentioned, is there still mesh blocking insects from entering? For my bicycle tours, I upgraded last year to a previous model-year Sierra Designs Light Year 1 and I'm really happy with it. Weighs 2lbs, 11oz., packs down very small (I can get my tent body, footprint, rainfly, sleeping bag, and pad all in one rear pannier! ), sets up super-quick, and is great if you happen to be a tall person. I'm 6'2" and one problem I've had with other 1-person tents is not being able to sit up or change clothes. No problem with the Light Year. I found one in my area for $90, but you'll likely pay more like $130 if you get it new. Sierra Designs' customer service has also shown to be stellar. They actually met up with me by bicycle to pick up my tent and a down puffy jacket, repaired a few small things, and mailed them back to me free of charge within a few days. The one thing about the Light Year that might not meet your criteria is the "free-standing" bit. This tent's structure depends on two stakes (at the head and foot), so if you're camping on loose sand or flat ledges of solid rock, it might not work. Look for yourself at the size of the screening in the door in the inner tent. The flap on the vestibule/fly is wrapped back and the screen on the inner tent is fully zipped shut. 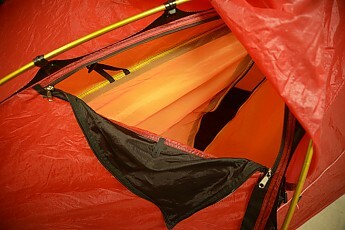 The section on the right of the photo is the nylon of the main tent body. If it is windy, blowing rain or snow, you zip the vestibule closed (it is fully open in the first picture of the Suolo above. There are several loops where you can hang an electric lantern inside, or you can use cord to provide extra rigidity in heavy winds with the loops (combined with the multiple guy lines). 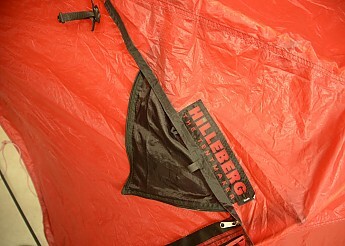 In case you didn't know, Hilleberg is a Scandinavian company. Summers in the arctic regions have lots of mosquitoes, black flies, noseeums, and other flying critters. bug-proofing is mandatory up there. Thanks again for all the info - I'm still deciding if I want to pay $650+ for a Hilleberg (I'm thinking the Unna, I like the two-pole setup), or save my money and just get one of the smaller, cheaper options I mentioned (like the Marmot Tungsten), and make due until I know that I would be using something like the Hilleberg to its full advantage. Since the first use for this tent will be a two-week bike tour, I'm sure the Hilleberg would be great for its incorporated rain fly (it may rain or be foggy on my route, probably chilly some of the time), but I can't decide if it'll be worth the cost. Also, using it on the road, it'll be more open to being stolen when the bike is parked some places, and will see more rough use than just regular backpacking. Moss made some bombproof stuff! Stuff that wouldn't blow away with the first puff of wind. Most of the stuff made today is fine on bluebird days but in serious weather don't count on it. I'd carry my Moss on the bike trip and if someone steals it.... fret not...... One thing you will know is that the Moss tent didn't cause anyone to die in a serious weather event. Well, I ordered an Unna direct from Hilleberg, but I also bought the Marmot Tungsten 1P at REI with my 20% discount today. I tried out the Tungsten at the REI store today - a bit tight compared to what I'm used to (I've mostly used nominally 2-person tents in the past for my solo trips), but very light and I liked it better than the equivalent Big Agnes tent. I'll try out the Unna when I get it - they said I can return it if I don't like it (as long as I don't get it dirty). Wincing at the cost, but looking forward to trying it out! 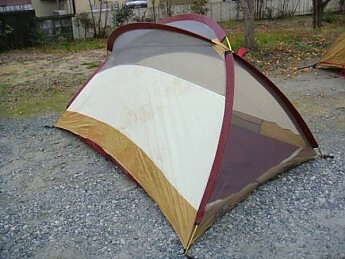 Ok, got the Unna - definitely a different kind of design than other tents I've had. I can't say I'm loving it (though I appreciate its quality). One thing that's bothering me is how the inner tent seems to be a big "saggy" as it hangs from points on the outer tent, as opposed to being directly attached to the poles. I've written to Hilleberg to ask if there's any way to make the inner tent more taut. I wouldn't want a saggy inner tent all the time. Topic: Tent: Northface Stormbreak-1 vs Marmot Tungsten 1P?